question_answer1) What is the difference between living and non-living things? question_answer2) Which of these plant fruit gives fibre from which clothes are made? question_answer3) Identify the animal without legs. question_answer4) The diagram below illustrates the water cycle. Which arrow represents the gaseous form of water? question_answer5) We need to eat ________ to stay healthy. question_answer6) Which of the following is NOT correct about diamond? question_answer7) What is the phase of the moon shown in the picture? question_answer10) From which of the following is cooking oil obtained? I carry a shell on my back. I can live both on land and in water. 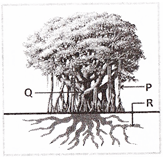 question_answer12) Which of the following labels represents the branch of the tree? question_answer13) Which of these is a domestic animal? question_answer15) Identify the stem part of a plant. question_answer16) Which of these animals lives on trees and land? question_answer19) Bones and muscles give a proper _________ to the body.